Can You Lay Tile on Plaster Walls? Plaster walls became popular due to the durability and strength of the surface and are more common in historic homes that drywall. This surface provides the right base for laying ceramic, porcelain or other types of tile. Some preparation and a certain style of installation makes the process easier and more successful. Tiling a wall protects the surface. Not all plaster wall surfaces will support the tile properly. Testing the wall for durability before you begin tiling saves a lot of work when the tiles begin to fall off of a weak or damaged wall. Gently poking the surface of the plaster wall shouldn't cause the surface to crumble into dust or crack. If your walls are too fragile and crumble when pressed on or bumped, they will fall apart under the weight of wall tiles. Both painted and bare plaster allows for the installation of tile. Loose paint must be scraped and sanded off to prevent the tile adhesive from failing to adhere. Holes or cracked plaster requires patching. 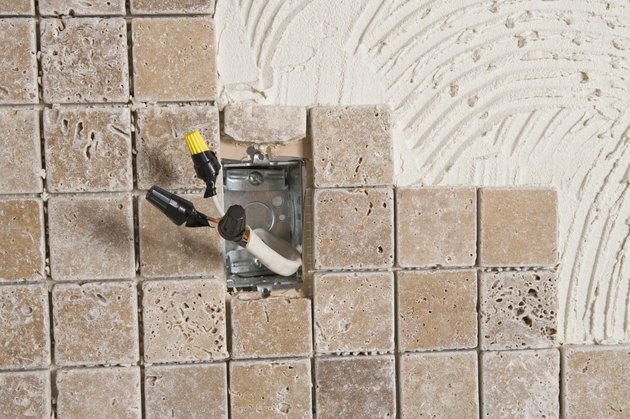 Don't try to use the tile setting adhesive or drywall joint compound to patch plaster walls. Fresh plaster, whether applied as a patch or to the entire wall, must dry completely before tile is applied. The adhesive and tile will block moisture from evaporating. Tiling over damp plaster causes the wall to fail because the plaster won't become strong if it can't dry out. Tiles attach to a wall through a layer of adhesive. Depending on the tile material, this adhesive is either a resin or epoxy-based glue or a traditional mortar that uses cement. Since intact plaster walls offer a smooth and sturdy backing for the tile, a thin-set method of tiling is preferred, according to "Construction Estimating Reference Data" by Ed Sarviel. Thin-set tiling calls for a thin layer of mortar or glue that the tiles are pressed into. This is much easier for a homeowner than the mortar bed required for tiling over wood panels. Portland cement and mortars based on this material work for adhering tile to many surfaces, but they won't work with plaster. The surface of a plaster wall is too smooth for the cement to grip to. A glue adhesive works better for installing tile over plaster. Some products are designed specifically for use between tile and plaster walls, but any tile setting adhesive designed for thin-set use will work.